Controlling and knowing what we eat should be a fundamental human right beyond questioning. That it is not sent hundreds of thousands into the streets of cities around the world on May 23, the third annual March on Monsanto. People on every continent save Antarctica participated in a March on Monsanto — demonstrations took place in 452 cites in 48 countries in opposition to Monsanto Company’s attempt to gain control over the world’s food. More than 200 U.S. cities, 47 Canadian cities, 22 French cities and 13 Argentine cities were among the places hosting organized marches. The struggle against dangerous pesticides received a boost earlier in the month in Germany when the country’s state consumer protection ministers called for a ban on glyphosate throughout the European Union. According to the online news publication EurActiv, E.U. approval of glyphosate expires at the end of 2015 and the E.U. bureaucratic arm, the European Commission, is conducting a safety review. Glyphosate is the active ingredient in Monsanto’s Roundup herbicide, a business worth an estimated $10 billion to Monsanto. The company not only sells lots of the herbicide but also agricultural products (soybeans, corn, sugar beets and other crops) that are genetically engineered to be resistant to Monsanto’s Roundup herbicide. Farmers growing these crops with Monsanto seeds can thus spray more herbicides on their crops. Unfortunately, as more pesticides are sprayed, weeds and insects become more resistant, inducing farmers to spray still more and thereby introduce more poisons into the environment. The use of glyphosate on U.S. farms increased from 11 million pounds in 1987 to almost 300 million pounds in 2013. There is plenty of reason for concern. Earlier this year, the World Health Organization released a study, published in The Lancet, that found glyphosate to be a “probable” carcinogen. Other studies, including a 2013 paper in Food and Chemical Toxicology, have also reported health concerns. Further, a 2011 Earth Open Source paper, titled “Roundup and birth defects: Is the public being kept in the dark?” says that the European Union and the German Federal Office for Consumer Protection and Food Safety cites “unpublished industry studies to back its claim that glyphosate was safe,” while ignoring or dismissing independent studies that indicate glyphosate causes endocrine disruption, damage to DNA, reproductive and developmental toxicity, cancer and birth defects. Then there are the dangers of GMO foods, an area unfortunately quite under-studied. GMO labeling is required by 64 countries, including Australia, Japan and all 28 E.U. countries. Such laws are fiercely opposed by Monsanto and other multi-national agribusinesses, and they thus far have succeeded in keeping labeling laws from being enacted in the U.S. These corporate efforts to undermine food safety are part of the agenda behind the secret Trans-Pacific Partnership (TPP) and Transatlantic Trade and Investment Partnership (TTIP). Marchers against Monsanto took to calling the TPP and TTIP the “Global Monsanto Protection Acts.” One of the goals of those two so-called “free trade” deals is to eliminate the ability of governments to ban or even effectively regulate GMOs, and to ban any labeling of them. Monsanto and other agribusinesses repeatedly claim that GMOs are safe and healthy, but if that is so, why do they put so much effort into hiding them? Biotechnology companies spent $27 million lobbying for GMOs in the U.S. in just the first six months of 2014. Should the TPP and TTIP come into force, nobody in the 40 countries that encompass these two agreements will be able to know what is in the food they eat or to have effective protection against food that may not be safe to eat. Already we being used as laboratory experiments, and this will accelerate if Monsanto gets its way. “Free trade” agreements have very little to do with trade, and much to do with eliminating regulations, lowering standards and eliminating health, safety and environmental laws in favor of maximizing corporate profits. The “harmonization” that is promoted in these agreements has meant reducing standards to the lowest possible level. Thus, European regulations on GMOs and food labeling will be targeted as “barriers” to trade under the TTIP because those standards are higher than U.S. rules. Already, an E.U. paper that could have led to the banning of as many as 31 pesticides was not acted on because of heavy pressure from chemical companies on both sides of the Atlantic. A delegation of U.S. chemical-industry lobbyists and U.S. trade officials insisted that the E.U. drop proposals to ban the use of the pesticides despite health concerns. Just as it is asked why Monsanto and other agribusinesses don’t want you to know what is in your food, we must ask why they don’t want us to know what is in the “free trade” agreements being negotiated on their behalf. Perhaps as a backup in case the mounting public opposition to the TPP and TTIP succeeds in scuttling them, a Kansas Republican, Mike Pompeo, has cooked up a bill with the Orwellian name of “Safe and Accurate Food Labeling Act of 2015” (Bill H.R. 1599) in the House of Representatives. H.R. 1599 was introduced on March 25 and is a re-introduction of the previous Congress’ H.R. 4432, which failed to become law. The bill’s stated purpose is: “To amend the Federal Food, Drug, and Cosmetic Act with respect to food produced from, containing, or consisting of a bioengineered organism, the labeling of natural foods, and for other purposes.” Well, yes, but in what way? Taking on Monsanto is already difficult. The Organic Seed Growers & Trade Association filed a suit against Monsanto, challenging the company’s patents on genetically engineered seeds, a suit that eventually represented 300,000 individuals and 4,500 farms. The organic plaintiffs sought a pre-emptive judgment against potentially being accused of patent infringement should their fields become contaminated by Monsanto’s genetically modified seed. Such suits are not unknown. Nonetheless, the courts ruled for Monsanto at the trial and appellate levels. “[T]he [U.S. Food and Drug Administration] had ushered these controversial products onto the market by evading standards of science, deliberately breaking the law, and seriously misrepresenting the facts — and that the American people were being regularly (and unknowingly) subjected to novel foods that were abnormally risky in the eyes of the agency’s own scientists. Mr. Druker is a public-interest attorney who successfully sued to gain access to FDA files. So confident is he in his findings that he has publicly challenged Monsanto to refute anything in his book and said he will change anything that is proven to be incorrect. Speaking at the New York March on Monsanto, he reported that he had not received a response. Monsanto is perhaps the corporation most determined to control the world’s food. The vast majority of U.S. soybean, cotton, corn and canola are now genetically engineered. Seeds containing genes patented by Monsanto, the world’s largest seed company, account for more than 90 percent of soybeans grown in the U.S. and 80 percent of U.S.-grown corn, according to Food & Watch Watch. Standard contracts with seed companies forbid farmers from saving seeds, requiring them to buy new genetically engineered seeds from the company every year and the herbicide to which the seed has been engineered to be resistant. Farmers have become hired hands on their own farms under the control of Monsanto. We live under an economic system that reduces human interactions to nothing more than transactions, where an ever larger sphere of social decisions are made by “the market” and the quest for profits is promoted as the highest ideal. “The market” is not some neutral entity sitting high in the clouds, as pervasive propaganda would have us believe, but rather nothing more than the aggregate interests of the most powerful industrialists and financiers. A monopoly is the goal of capitalists, and the logical outcome of the relentless competition of capitalism. Just because food is among the most basic human necessities does not mean it is exempt. Don’t starve, organize! The ultimate monopoly would be control of the world’s food supply. Although not the only multi-national corporation attempting to achieve the ability to dictate what you eat, Monsanto Company appears the most determined. Already infamous for toxic chemicals such as polychlorinated biphenyls (PCBs), Agent Orange and dioxin, Monsanto’s march toward control of the world’s food supply is focused on proprietary seeds and genetically modified organisms. No corporation or corporate oligarchy possessing a food monopoly would be desirable, but Monsanto is a particularly frightening contender. So powerful is the company that a special law tailored for it was snuck into a congressional appropriations bill funding U.S. government operations. The Farmer Assurance Provision — better known by its nickname, the “Monsanto Protection Act” — was quietly slipped into an appropriations bill in March by a Missouri senator, Roy Blunt. The appropriations bill had to be passed to avert a government shutdown, providing an opportunity to do a favor for the powerful. Slipping off-topic special measures into bills hundreds of pages long is routine in the U.S. Congress. The Monsanto Protection Act expires at the end of the government’s fiscal year, September 30, with the expiration of the appropriations bill of which it is a part, but the language could easily be included in next year’s appropriations bills. As outrageous as the special provision is, it is consistent with the basic methodology of public safety in the United States — new products are routinely put on the market with minimal testing (or the product’s manufacturer providing the only “research” and declaring it safe), and can’t be removed from sale until independent testing determines the product is unsafe. DuPont is one of the world’s largest chemical corporations and a major competitor in many fields. If an enterprise as powerful as DuPont finds itself at the mercy of Monsanto, what chance does a family farmer have? The reference to “Roundup Ready” in the quote above is a reference to a suite of Monsanto agricultural products (soybeans, corn, sugar beets and other crops) that are genetically engineered to be resistant to Monsanto’s Roundup herbicide. Farmers growing these crops with Monsanto seeds can thus spray more herbicides on their crops. Unfortunately, as more pesticides are sprayed, weeds and insects become more resistant, inducing farmers to spray still more and thereby introduce more poisons into the environment. As with the consolidation of seed companies, the rise of genetically engineered crops and the right to patent living organisms is a recent development. After decades of refusal by the U.S. Congress to allow patents on food-producing plants that re-produce via seeds, it passed a law in 1970 allowing patenting of “novel” varieties produced from seeds. Proprietary seeds now account for 82 percent of the world’s commercial seed market. Monsanto, according to the ETC Group, directly accounts 23 percent of the world’s seed sales by itself. Monsanto and the next two biggest seed companies, DuPont and Syngenta, sell almost half. Once a farmer contracts with a giant seed company, the farmer is trapped. Standard contracts with seed companies forbid farmers from saving seeds, requiring them to buy new genetically engineered seeds from the company every year and the herbicide to which the seed has been engineered to be resistant. Monsanto aggressively litigates against farmers to enforce this provision, dictates farming practices and requires its inspectors to be given access to all records and fields. The company has even sued neighboring farmers whose fields unwillingly became contaminated with Monsanto’s seeds. Genetically modified crops, of course, are carried along by winds and don’t stop at property boundaries. 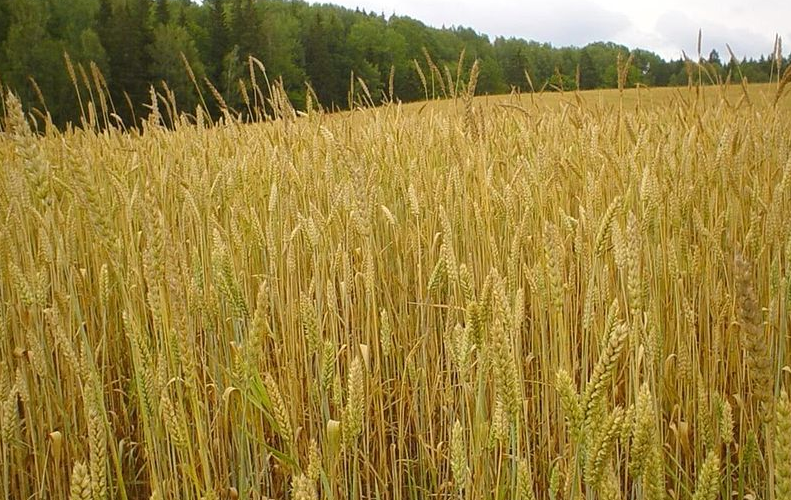 Last month, genetically modified wheat was discovered in the fields of a farmer in Oregon. The Guardian reports that the wheat has never been approved for human consumption and is a variety developed by Monsanto in an experiment that ended a decade ago. Several Asian countries responded to this news by banning imports of U.S. wheat and the European Union advised wheat shipped from the U.S. be tested. Hoping to expand its reach, Monsanto (and three other corporations) are attempting to corner the market in maize in Mexico, the staple crop’s birthplace. The companies have applied to plant genetically modified maize on more than two million hectares in two Mexican states. Already, according to a report in Truthout, farmers near Mexico City have found their crops contaminated with genetically modified maize. Sixty-four countries currently require GMO labeling, but such labeling in the United States is bitterly fought by Monsanto and other giant agribusinesses. The companies argue that GMOs are safe, but if they are so proud of their products, why do they resist them being put on a label for consumers to see? Nor does the revolving door between the U.S. Food and Drug Administration and Monsanto inspire confidence. Corporate lawyers and others who have done work for Monsanto, for instance, subsequently moved to the FDA, where they gave approval for Monsanto products. Although corporate executives going to work for the U.S. government agencies that regulate them, then going back to their companies, is a common practice, Monsanto has sent an extraordinary number of executives to government posts. Nonetheless, this specter shouldn’t be looked at overly simplistically as Monsanto being an evil company. It and its competitors are acting in the way that capitalist competition mandates they act — grow or die is the ever present imperative. All industries move toward monopolization (a handful of companies dominating an industry, not necessarily a “pure” monopoly of one); corporations grow to such massive size that they can dominate their societies; and the surviving corporations convert ever more human activity or traditionally public spheres into their private profit centers. This is the natural result of market competition and allowing “markets” to determine social outcomes. Monsanto happens to be the company that is most ruthless at navigating and further developing these ongoing systemic trends, just as Wal-Mart is the company that is the leader among retailers forcing the moving of production to the lowest-wage countries, squeezing suppliers and exploiting workforces. That does not mean that we should be content to allow Monsanto to grab control of the world’s food supply or make life itself a commodity. Quite the contrary. The specter of any enterprise gaining a monopoly over food is too frightening to contemplate, never mind an enterprise so dedicated to squashing anybody who gets in its way. The idea of Monsanto (or any other corporation or bloc of corporations) wresting control of the world’s food supply sounds like a bad science fiction movie or a crazy nightmare. But modern capitalism is heading toward that previously unthinkable place. The time is to organize is now, for we never have as much time as we think we do.